Iran Nuclear Talks: Moving Toward an Agreement? As the negotiations on the Iranian nuclear programme approach the Jul. 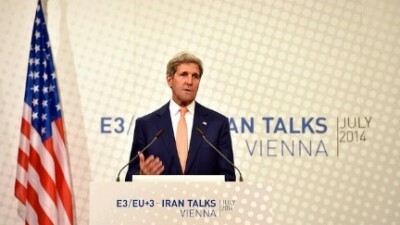 20 deadline, both U.S. Secretary of State John Kerry and Iranian Foreign Minister Mohammad Javad Zarif have signaled through their carefully worded statements that they are now moving toward toward agreement on the two most crucial issues in the talks: the level of Iranian enrichment capability to be allowed and the duration of the agreement. Their statements after two days of meetings Sunday and Monday suggest that both Kerry and Zarif now see a basis for an agreement that would freeze Iran’s enrichment capacity at somewhere around its present level of 10,000 operational centrifuges for a period of years. Once the difference between the proposed duration of the two sides has been reduced to a very few years, both sides may well conclude that the difference is not important enough to sacrifice the advantages of reaching agreement. They also indicated that the two sides have not yet agreed on how many years the agreement would last, but that the bargaining on that question has already begun. Zarif’s comments to New York Times correspondent David E. Sanger suggested movement toward an accord on the two key issues of the level of enrichment capacity and the duration of the agreement. “I can try to work out an agreement where we would maintain our current levels,” Zarif was quoted as saying. The Wall Street Journal reported Tuesday that a diplomat involved in the talks had said Iran had proposed freezing the number of centrifuges at 9, 400 – roughly the same number that have actually been operating. Iran has another 9,000 centrifuges that were installed but never hooked up or operated, suggesting that Iran intended to trade them off for concessions from the P5+1 in eventual negotiations even before Hassan Rouhani became president last year. Zarif’s latitude for negotiating on the expiration date may be wider than has been assumed because Iran is pursuing a possible deal with Russia on cooperation in fuel fabrication, according to a document on Iran’s nuclear energy needs recently released by the government. Such an agreement could eliminate the need to begin replacing Russian fuel immediately after the expiration of the present contract. By referring to the 19,000 figure rather than to the 10,000 operative centrifuges, Kerry was leaving the door open to a deal that would cut half of Iran’s total centrifuge capacity. As recently as June, Obama administration officials were leaking to the press a demand that Iran would have to accept a cut in the number of centrifuges to between 2,000 and 4,000. The rationale for that demand was that Iran’s existing level of centrifuges would allow it the capability to achieve a “breakout” to sufficient weapons-grade uranium to build a single nuclear weapon in only two to three months, and that Washington was insisting on lengthening that “breakout timeline” to six to 12 months. But the administration is well aware that another way to achieve that objective is to reduce Iran’s low enriched uranium stockpile to close to zero. Zarif explained to the Times correspondent the Iranian proposal, which was part of the negotiating draft, to guarantee that no breakout capability would exist even with the current level of Iranian enrichment. The foreign minister claimed that his proposal would lengthen the “breakout timeline” to more than a year, according to Sanger. As described by Zarif to IPS in early June, the plan is designed to assure that no low enriched uranium would be available for weapons-grade enrichment for the duration of the agreement. Sanger reported that American officials are “doubtful” that it would accomplish that objective but offered no explanation and did not quote any official. That suggests that Sanger was relying on what U.S. officials had said about the “breakout” issue before the Kerry-Zarif negotiations. Kerry did not address the issue of duration of the agreement in his press conference remarks. But a U.S. official was quoted in a Jul. 12 Reuters story as declining to give a specific number but as saying that the United States wanted it to be “in the double digits”. In earlier briefings for the news media, U.S. officials had indicated that the United States wanted the agreement to last 20 years. Before the Kerry-Zarif meetings, the senior U.S official briefing journalists Jul. 12 had criticised Ali Khamenei’s Jul. 7 speech referring to Iran’s need for the equivalent of 190,000 first generation centrifuges. The official had said that the number would be “far beyond their current programme” and that the U.S. had said the existing capacity needed to be cut instead. That suggested that Iran was insisting on getting approval for that increased capacity in the agreement. In his news conference, however, Kerry clearly suggested that Khamenei’s citation of the 190,000 figure is not a deal-breaker. “[I]t reflects a long-term perception of what they currently have in their minds with respect to nuclear plants to provide power,” Kerry said. “[I]t was framed what way, I believe, in the speech,” he added. Kerry was implying that Khamenei’s vision of industrial scale enrichment would not fall within the time frame of the agreement, presumably on the basis of his talks with Zarif. That answer suggests that Kerry is now considering an Iranian proposal on the duration of the agreement that would put off the beginning of Iran’s buildup to industrial level enrichment to a point close to or within the “double digit” period of years demanded by the United States. The Obama administration is still assessing whether to request an extension of the talks beyond Sunday’s deadline, but it may not take long to wrap up an agreement once the decision reach compromise on the two key issues is made.